1. Fiat Chrysler: Great Wall Motor said Monday that it was exploring a bid for the parent company of Jeep, Maserati, Dodge, Ram and Alfa Romeo. "We have the willingness to buy FCA," a company spokesperson said. Shares in Fiat Chrysler (FCAU) added 3.3% in Milan, while Great Wall (GWBU) gained 1.6% in Hong Kong. 2. China criticizes U.S. probe: China has expressed "strong dissatisfaction" over the Trump administration's decision to launch an investigation into some of its trade practices. The Chinese Commerce Ministry accused the U.S. of "unilateralism and protectionism," saying it will take "all appropriate measures ... to safeguard China's legitimate rights and interests." The U.S. Trade Representative Robert Lighthizer announced Friday that he was formally starting an investigation into whether China is unfairly getting hold of American technology and intellectual property. 3. Total's oil deal: French oil giant Total (TOT) has struck a deal to buy the oil and gas business of A.P. Moller-Maersk. Total will pay with shares worth $4.95 billion, and assume $2.5 billion of the Danish company's debt. Total shares were trading 0.6% lower in Paris. 4. 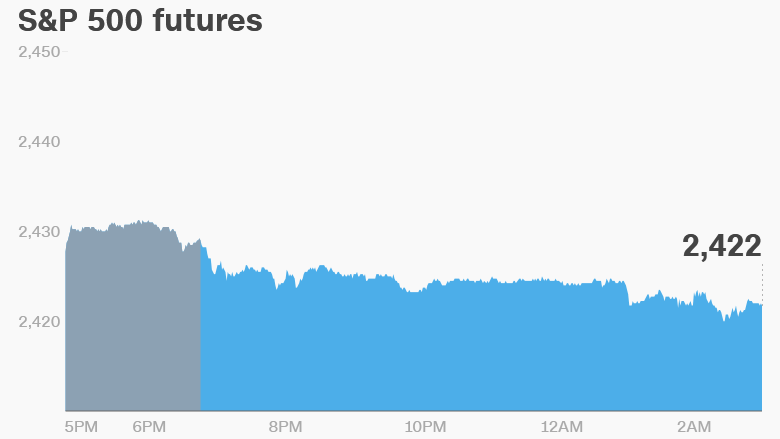 Global market overview: U.S. stock futures were lower early on Monday, pointing to another day of losses on Wall Street. The Dow Jones industrial average closed 0.4% lower on Friday, while the S&P 500 was down 0.2% and the Nasdaq shed 0.1%. European markets opened lower on Monday. Asian markets ended the session mixed, with markets in Japan and Korea suffering losses. 5. Economics: Germany's finance ministry has warned that the crisis hanging over diesel cars could pose a risk to the country's economy. In its August monthly report, it added the auto industry crisis to Brexit and Trump's stance on trade as risks to Germany. "The so-called Diesel Crisis must be classified as a new risk, even though its effects cannot be estimated at present," it said.